Happy Valentines Day! 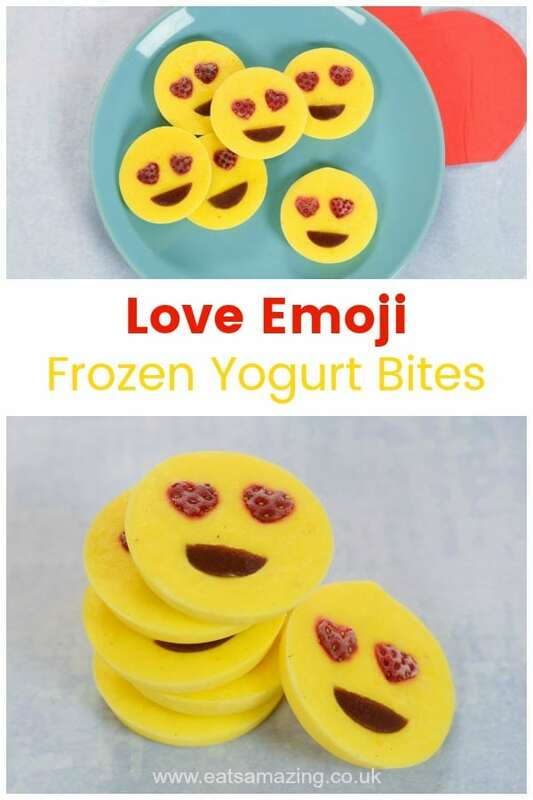 I have one final Valentines recipe for this year to share with you today – these fun love emoji frozen yogurt bites! 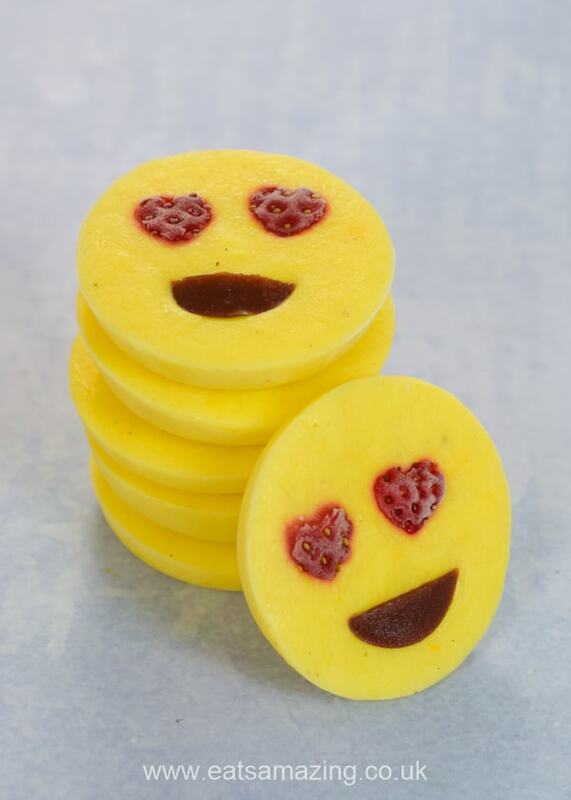 I’ve really enjoyed creating several fun emoji themed food ideas in the run-up to Valentines Day this year – first we had love emoji cupcakes, then love emoji oranges, and now these fun emoji inspired yogurt bites! 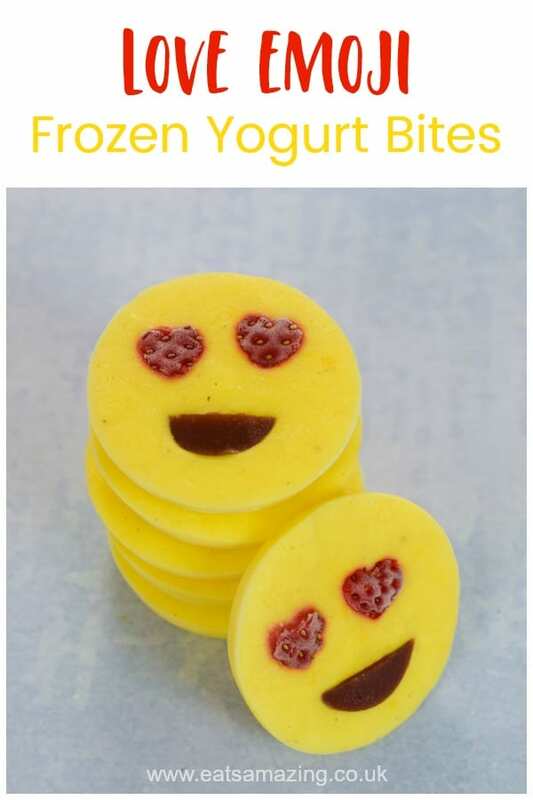 These cute yogurt bites are super easy to make and are perfect for after school snacks or a fun Valentines dessert. My boys absolutely loved this recipe and I’ve had several requests to make them again in the last week or so! Place the yogurt in a small bowl and add a few drops of yellow food colouring. Stir well to combine until the yogurt is bright yellow – you may need to add a little more food colouring to get the desired shade. 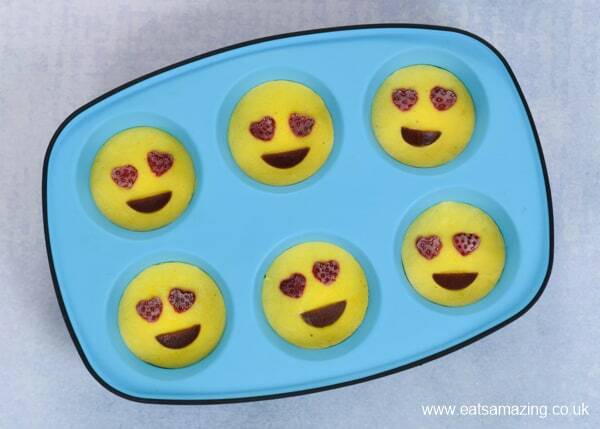 Drop spoonfuls of yogurt into a 6 hole silicone muffin tin, dividing it equally between the sections. If you don’t have a silicone muffin tin, try using silicone cupcake or muffin cases instead. Tap the muffin tin on your worktop to level the yogurt. Cut slices from the strawberries, then cut mini hearts from the strawberry slices, using a mini bento cutter. 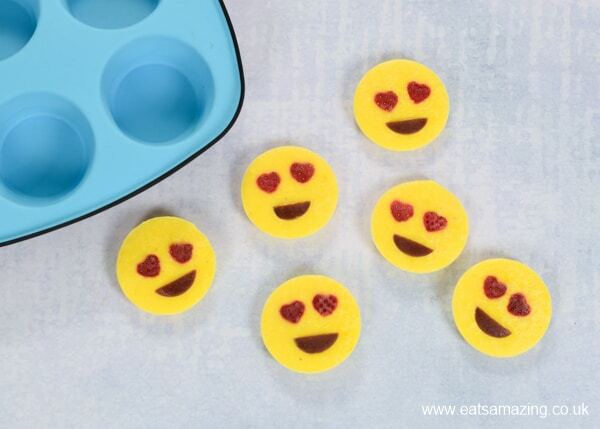 Cut mouth shapes from the dried fruit roll-up using a small round cutter or by hand. Carefully place 2 hearts and a dried fruit ‘mouth’ into each section of the muffin tin, taking care not to push them too far into the yogurt. Place the muffin tin in the freezer and leave to freeze for a couple of hours until set solid. Once frozen through, pop the yogurt bites out of the muffin tin and serve. Note: If not eating immediately, you can also bag them up and pop them straight back in the freezer to eat later. 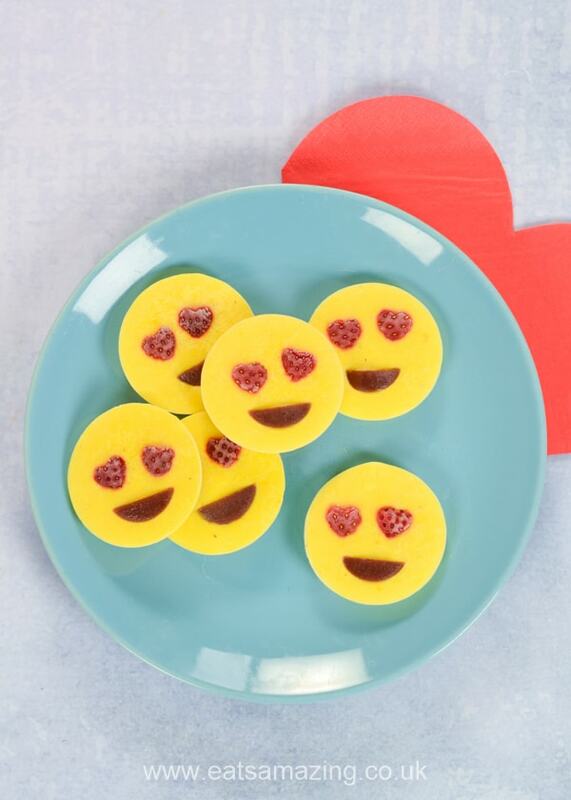 These super easy love emoji frozen yogurt bites make a great fun snack or healthy dessert that kids can make themselves! Place the yogurt in a small bowl and add a few drops of yellow food colouring. Stir well to combine until the yogurt is bright yellow - you may need to add a little more food colouring to get the desired shade. Drop spoonfuls of yogurt into a 6 hole silicone muffin tin, dividing it equally between the sections. If you don't have a silicone muffin tin, try using silicone cupcake or muffin cases instead. Carefully place 2 hearts and a dried fruit 'mouth' into each section of the muffin tin, taking care not to push them too far into the yogurt. 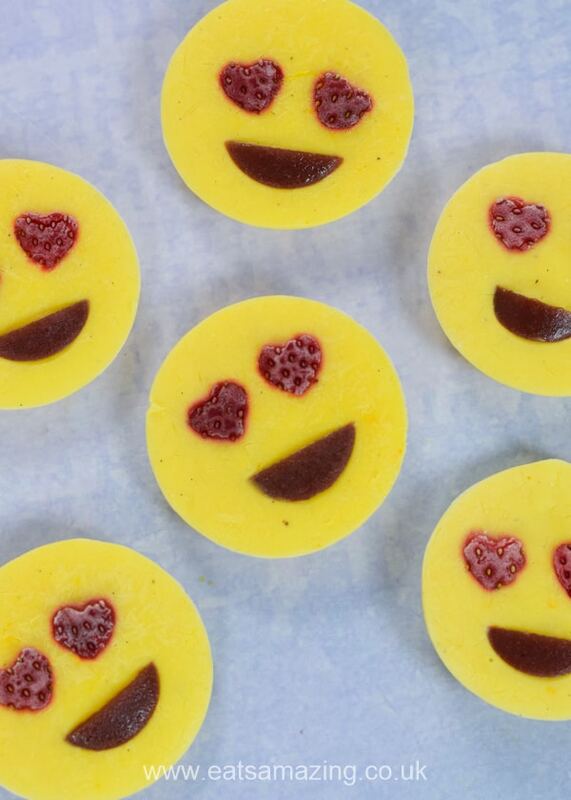 Love this fun recipe? Why not save it to Pinterest so you can easily find it again!